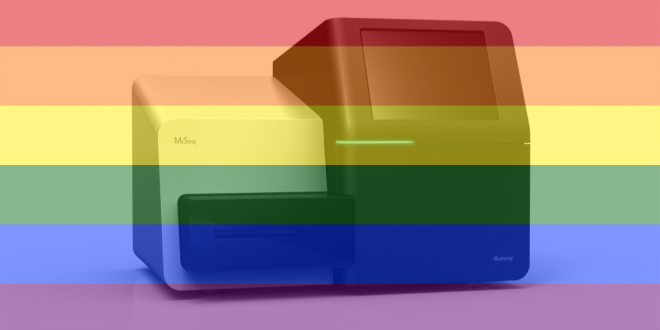 Multinational genome sequencing manufacturer, Illumina (NASDAQ: ILMN) have announced today that in addition to their personal genome sequencer, the “MiSeq” and the high throughput genome sequencer the “HiSeq”, they are to add a new genome sequencer in celebration of Marriage equality legislation in the United States, the “BiSeq” platform. “This new sequencer is specifically designed to sequence anything in any direction, no matter what kind of DNA it is”, said Illumina spokesperson R. M. Pitt. “We have developed new chemistry for identifying the bases and the Bi-Seq will be using a revolutionary new six-color dye scheme – Red, Orange, Blue, Green, Indigo and Violet”, instead of the old four-colour scheme”. “In the past, lots of kinds of DNA were prevented from being sequenced – long homopolymeric regions and heterochromatin regions, etc. Today, sequencing is available for all DNA, irrespective of its orientation in the genome”. “We see this as a step forward for fairness and equality for all genomes”.